In December 2009, Rachel Bartnicki was attending her daughter’s Christmas carol recital when her cell phone began to ring. Her Italian ice cream parlor in Sandy’s Canyon Shopping Center on 9400 South had flooded after a worker laying a power line behind the cafe hit a high-pressure water pipe. 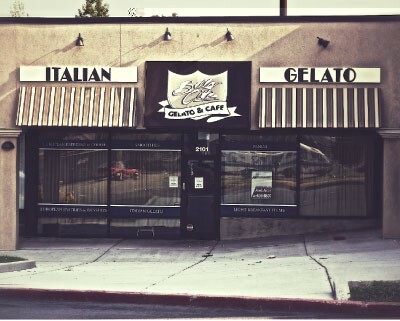 Bartnicki didn’t draw a connection between her prolonged illnesses and the dirt the flood had brought into her gelato shop until an offhand comment by her former strip-mall landlord about the neighboring dry cleaner, Milo’s, having an environmental issue led her to Utah’s Department of Environmental Quality. Environmental scientist Rocky Stonestreet of the DEQ’s Division of Solid & Hazardous Waste told her that Milo’s, which has been in operation since the mid-’90s, had, for an unknown period of time, leaked a highly toxic chemical called tetrachloroethene into the ground. A solvent used for spot-cleaning stains on clothing, the chemical, also known as PCE or “perc,” has two potentially devastating features. “They’re sinkers,” Stonestreet says, referring to the chemical’s propensity for heading straight down, geology permitting, to natural water sources. “When they hit the water table, they’re nasty.” It also generates vapors that, in Canyon Shopping Center’s case, became trapped under the concrete slabs of most of the one-level stores in the gently sloping, brown-walled strip mall at 9400 South and 2000 East, bookended by a sleepy ShopKo to the east and a popular Smith’s grocery store to the west. The International Agency for Research on Cancer has labeled tetrachloroethene as “probably” carcinogenic to humans. Symptoms from inhaling its vapors range from nasal and throat irritation to depression of the central nervous system, nausea and unconsciousness, and, when exposed to very high concentrations, death. Bartnicki can’t prove there’s a link between the PCE leak and her symptoms—which disappeared months after she closed her store—but says that isn’t the point. Her dogged pursuit of answers to her medical issues brought to light a leak of a highly toxic chemical of which, until she went to the DEQ, only the landlord, the consultant the landlord is using to investigate and clean up the mess, and the state were aware. Not only were no air samples taken within the tenant-occupied stores, but one year on from Wasatch’s acknowledgment that there was an issue with indoor air, nobody had told the tenants of the compounds their businesses rested upon. Much as how PCE can sink unnoticed through a crack in a concrete floor, so can the policing and regulation of potential contaminant sources like dry cleaners, as state and local agencies fail to communicate with each other—or with those who may be affected by contamination. That said, Moore contrasts the sub-slab vapors at Canyon Shopping Center to even more toxic chemicals, such as benzene in gasoline, that a motorist might inadvertently inhale while filling up the car. “The least of [a tenant’s] worries in his daily life could be a perc vapor,” he says. The tenants and staff of the seven stores—excluding the dry cleaner—above an approximately 255-foot-wide plume of PCE vapors aren’t the only people who were in the dark about the dry-cleaning chemical spill. 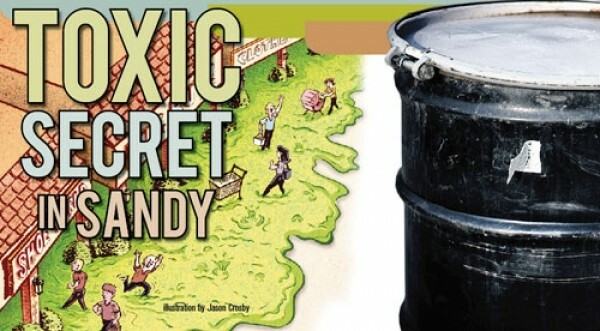 While Moore says his division assumed Wasatch had informed Sandy City about the leak, City Weekly found out that the municipality had not been contacted by the state, the landlord, their consultant or the dry cleaner that a PCE plume was potentially threatening an aquifer 500 feet below and a nearby municipal well. Jordan Valley owns a well even closer to the dry cleaner, and they, too, were not informed of the leak. Bowler knows how hard PCE can be to tackle. In 2005 and 2007, a tiny amount of PCE in the water necessitated the closing down of two Sandy wells polluted by a yet-to-be identified PCE plume, each of which represents an investment of hundreds of thousands of dollars. Since 1996, all major suppliers of public water in Utah have had to provide an annual updated plan to protect groundwater sources against accidental contamination. Sandy’s first plan submitted in 1996 to the DEQ’s Division of Drinking Water notes that “although there are numerous federal and state regulations, there are still many types of potential contamination sources that could either be inadequately controlled or uncontrolled under the existing regulations. This is especially true for very small generators and users of hazardous materials,” such as dry cleaners, 99 percent of which go largely unregulated, says DEQ’s Moore. That would appear to include Milo’s, which was listed in the 1996 plan—as Henrie’s Dry Cleaning—as one of 200 potential contaminant sources in Sandy. Bowler faults DEQ for lack of communication, as well as his own city utility. He says Sandy City has failed to follow its own program on managing potential contaminant sources. A representative from Dee’s declined an interview request on advice from legal counsel. Wasatch Environmental also did not respond to an interview request and, despite several visits by a City Weekly reporter to Milo’s dry cleaning, owner Kenton Henrie did not respond to requests for comment made to an employee and his daughter. His daughter says Henrie is currently in Nevada, working in mining. In 1993, Milo’s, operating then as Henrie’s Dry Cleaning, filed a notification of hazardous-waste activity with the DEQ. Dry cleaners like Milo’s come under the category of conditionally exempt small-quantity generators, meaning that the amount of “perc” they use is so small it escapes ongoing scrutiny. But in 2003, a routine DEQ inspection revealed “improper hazardous-waste management practices” at the facility. Because of its exempt status, however, Moore says, the violations did not result in red flags requiring further scrutiny of the business. In 2011, a Colorado-based retail property management company was interested in purchasing Canyon Shopping Center from Dee’s Inc. According to the DEQ documents, at the request of the Colorado company, Wasatch Environmental completed a records check and sampled the soil beneath the Canyon Shopping Center because of the presence of the dry cleaner. Along with documents that indicated the dry cleaner had handled chemicals inappropriately in 2003, Wasatch also found PCE vapors in the soil. Wasatch concluded in a June 7, 2011, report that “it appears that a release from the dry cleaning has occurred.” Subsequent Wasatch reports were sent to Dee’s Inc. While the DEQ is quick to provide requested documents, the reports’ highly technical nature can make transparency difficult. Reports produced by consultants, say industry experts, can be vetted by clients, so the final result provides numbers but very few conclusions. “The data is in there, but oftentimes there’s very little in the way of critical interpretation,” says Chris Mikell, an environmental consultant with Bowen Collins & Associates, a consulting engineers firm that works for Sandy City. Wasatch’s reports do provide some basic measurement tools. 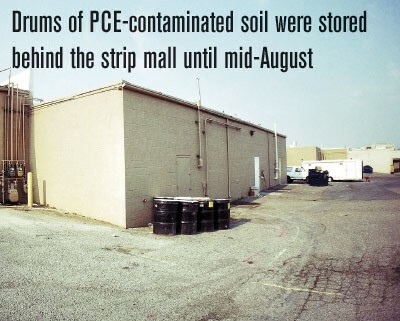 The highest concentration of PCE in the soil was directly underneath the dry cleaner. It measured 22 million micrograms per cubic meter of air (Âµg/m3). That is more than 1 million times the baseline of 21 Âµg/m3 that Wasatch cites in its reports. That baseline figure, Moore explains, is 10 times the EPA’s screening level for industrial air, since it has to allow for a fraction of those gases hypothetically seeping up through cracks in the concrete slabs beneath the stores. The baseline, he says, indicates “the potential risk for you and I sitting in this room of exposure to risk for PCE. We can abate that risk by turning on a fan.” Other than under the dry cleaner, according to Wasatch’s reports filed with DEQ, they took soil and soil-vapor samples only from vacant stores and land external to the strip mall. That annual report also has a list of management strategies for each type of Potential Contaminant Source. For dry cleaners, Sandy’s public-water-system team is supposed to, among other oversight actions, “request” that all 55-gallon or larger drum containers have secondary spill containment and ask the business to notify them “in the event of a leak or spill.” Despite those requirements dating back to 1996, the Canyon Shopping Center dry cleaner, according to a Wasatch report, did not have secondary containment until 2007. In fall 2011, Wasatch took soil samples from beneath vacant stores, under the asphalt and from the soil of the parking lots front and back, sketching out the vertical extent of a plume that it reported to its client stretched from the dry cleaner down a descending gradient to a vacant store several shops east of Smith’s. “The PCE vapors appear to be spreading laterally within the gravel layer, which underlies the concrete floor slabs of the building and the asphalt in the parking lot,” Wasatch noted in a December 2011 report. Wasatch’s numbers showed that while elsewhere under the stores the concentrations of PCE vapor were nowhere near as high as the dry cleaner, there were vapor samples that measured in the hundreds of thousands until it declined to, at the farthest point west, 3,100 Âµg/m3. But the vapors were only part of the problem. PCE is a formidable foe. It’s very hard to predict, say environmental scientists. It can pool or spread, but it also migrates downward. DEQ wanted to know how far down had the dense nonaqueous-phase liquids [DNAPL] of the PCE migrated toward the aquifer. Wasatch’s drilling, curtailed by their machinery being unable to go down any farther than 60 feet, nevertheless found PCE as far as 58 feet. Most PCE leaks are historic, meaning their source often is decades-old or long-since-closed facilities, be they dry cleaning operations or factories. Stonestreet suspects that the majority of the Canyon Shopping Center leak occurred before 2007, but, when a worker was putting in a vent under the dry cleaner on Feb. 21, 2012—a full nine months after Wasatch began investigating the PCE plume—he noticed liquid spilled on the floor by a large crack in the concrete floor. That crack, subsequently sealed, is where Stonestreet and Moore suspect the PCE had been leaking into the soil. So, in February 2012, Wasatch installed five sub-slab ventilation systems to pump out the vapors beneath Canyon Shopping Center into the atmosphere. Vents, which rise 2 feet above the strip, were installed under two vacant stores, a bike store, a health-food store and the dry cleaner. The vent for the dry cleaner during a 30-minute sampling on Feb. 24, 2012, kicked out 3 million micrograms per cubic meter, against a baseline of 5,561 Âµg/m3. The other vents ranged from 17,000 Âµg/m3 at the lowest through to 320,000 Âµg/m3. Monthly follow-up tests, again sampling 30 minutes, showed concentration levels decreasing. By May, two of the five vents were consistently below the toxic screening level. On a hot early August afternoon, a City Weekly reporter went door to door in the strip mall to find out if the tenants had been informed of the plume. Out of the seven stores the reporter visited, only one tenant was aware of the leak and that was because former gelato café owner Bartnicki had told her. Vicki Galloway is co-owner of Herbs for Health. Bartnicki went to her for help with the white fungus in her mouth. After Bartnicki shared what she found out earlier this year, Galloway has been taking vitamins and antioxidants and drinking only the distilled water she sells at her store. “I am concerned for people who don’t know what to do,” she says. A manager at a busy nail salon asked what he should do to learn more. Two young women manning the desk at a tanning salon also knew nothing, although one acknowledged “seeing the barrels” when she took the trash out. Cindy Robison owns the Chocolate Covered Wagon, which is toward the end of the strip mall, several doors from the high-traffic Smith’s. She recalls a worker telling her not to worry, that she was far away from the dry cleaner, a statement at odds with the apparent movement of the PCE vapors down the gradient. The worker pointed to the Smith’s gas station and told her the toxins in gasoline were a lot more dangerous. In the 10 days after City Weekly alerted Bowler to the PCE leak, he was far from idle. He organized testing of the municipal well for late August and contacted public-utility operations managers at neighboring Jordan Valley and Salt Lake City to discuss their experiences with DEQ, only to hear complaints of the state failing to notify bottom-line water agencies when there was a threat to water quality. When Bowler talked to DEQ’s Allan Moore, he learned that the state was monitoring not only Milo’s, but a second Sandy dry cleaner. “Boy, you’d think you’d have some public notification,” Bowler says. He asked Moore if a clay layer in the ground would stop PCE from reaching an aquifer, only to learn Moore was aware of instances “where it permeated even dense clay. There’s a lot of unknowns,” Bowler adds. Other municipalities Bowler talked to are, like Sandy, not only in the dark, but also strapped for resources to check up on potential contaminants. “It’s mind boggling,” he says. With so many regulations the city has to comply with, monitoring potential contaminant sources ended up falling to the wayside. “If you don’t have any time to inspect, what good is it?” Bowler asks. In the 12 years he’s been operations manager, he’s lost two wells to PCE. He doesn’t want to lose any more.